QOS configuration class. Contains all the parameters for QOS functions as well as functions to check whether either TOS or MARK QOS is enabled. Definition at line 172 of file QosConfig.h. Definition at line 273 of file QosConfig.cc. Definition at line 177 of file QosConfig.h. NOTE: Due to the low-level nature of the library these objects are part of the dump function must be self-contained. which means no StoreEntry references. Just a basic char* buffer. NOTE: Due to the low-level nature of the library these objects are part of the dump function must be self-contained. which means no StoreEntry refrences. Just a basic char* buffer. Definition at line 456 of file QosConfig.cc. References isHitNfmarkActive(), isHitTosActive(), markLocalHit, markMiss, markMissMask, markParentHit, markSiblingHit, p, preserveMissMark, preserveMissMarkMask, preserveMissTos, preserveMissTosMask, tosLocalHit, tosMiss, tosMissMask, tosParentHit, and tosSiblingHit. Iterates through any outgoing_nfmark or clientside_nfmark configuration parameters to find out if any Netfilter marking is required. This function is used on initialisation to define capabilities required (Netfilter marking requires CAP_NET_ADMIN). Definition at line 594 of file QosConfig.cc. 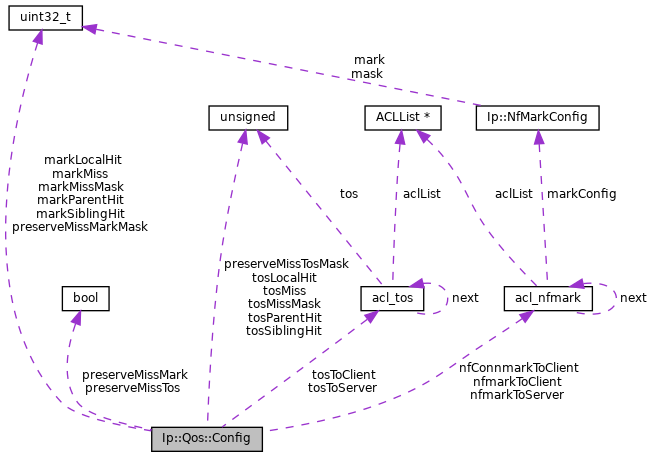 References i, Ip::NfMarkConfig::isEmpty(), acl_nfmark::markConfig, acl_nfmark::next, nfmarkToClient, and nfmarkToServer. Iterates through any outgoing_tos or clientside_tos configuration parameters to find out if packets should be marked with TOS flags. Definition at line 611 of file QosConfig.cc. References i, acl_tos::next, acl_tos::tos, tosToClient, and tosToServer. Definition at line 196 of file QosConfig.h. Definition at line 191 of file QosConfig.h. Definition at line 284 of file QosConfig.cc. References DBG_CRITICAL, DBG_IMPORTANT, debugs, markLocalHit, markMiss, markMissMask, markParentHit, markSiblingHit, max(), ConfigParser::NextToken(), NULL, preserveMissMark, preserveMissMarkMask, preserveMissTos, preserveMissTosMask, self_destruct(), tosLocalHit, tosMiss, tosMissMask, tosParentHit, tosSiblingHit, and xstrtoui(). Definition at line 222 of file QosConfig.h. Referenced by dumpConfigLine(), and parseConfigLine(). Definition at line 225 of file QosConfig.h. Referenced by Ip::Qos::doNfmarkLocalMiss(), dumpConfigLine(), and parseConfigLine(). Definition at line 226 of file QosConfig.h. Definition at line 224 of file QosConfig.h. Definition at line 223 of file QosConfig.h. Definition at line 234 of file QosConfig.h. Definition at line 233 of file QosConfig.h. Definition at line 232 of file QosConfig.h. Definition at line 227 of file QosConfig.h. Definition at line 228 of file QosConfig.h. Definition at line 219 of file QosConfig.h. Definition at line 220 of file QosConfig.h. Referenced by Ip::Qos::doTosLocalMiss(), dumpConfigLine(), and parseConfigLine(). Definition at line 214 of file QosConfig.h. Definition at line 217 of file QosConfig.h. Definition at line 218 of file QosConfig.h. Definition at line 216 of file QosConfig.h. Definition at line 215 of file QosConfig.h. Definition at line 231 of file QosConfig.h. Definition at line 230 of file QosConfig.h.